Final images need to be 2200x1700px, and 300 dpi resolution, in the .png format. If you're not sure what this means, please download and use this template to ensure your design is the right size (note - this is a new template, to suit Zazzle standards. If you have used the cafepress template we've offered in the past, please delete it and use this new template instead!). Based on last year's calendar, can we ask members to have their designs covered all the way to the edge, even if it just some background colour. Please also make sure that any important details are kept within the first rectangle, again to ensure they are not omitted during final printing. How the winning designs will be chosen: After the closing date of the artwork section of the competition has closed, details will be made available on how to vote for which pieces of artwork you would like to see featured for each month. This way, everyone on Obernet can enter, and anyone can win. It's a calendar for Obernewtyn.net members - voted by the members! ;) If you have any questions about the Calendar competition or wish to discuss ideas with other members, please visit 'The 2011 Calendar Comp' thread in Artistmerge. Otherwise - get creative and upload that artwork! This is really supposed to depict the panels that the overguardian shows Elspeth in the Stone Key, but my photoshop skills are really failing at the moment. The first two 'panels' show Beforetime buildings, the third panel is supposed to depict fire destroying the buildings. I would have like to have a picture of something blown up, but how many un-copyright pictures of those are there :P. The fourth panel is the sun rising on the now blackland infested land. Number five it a window of nature, creating a new canvas so to speak. And the sixth one is supposed to allude to the purity of water, trying to cleanse the land. There were a few suggestions for it I wanted to try out but to get my image in on time it has to stay as it is. Pretty simple, just fanart of Elspeth, using a tablet and Photoshop. I hope it's not too dark, or something. I spent hoours focussing on Elspeth herself. I sort of regret not doing something more exciting but at the same time I'm pretty proud of how it's turned out. And I wanted to get more involved in the site, so... yeah. :3 I hope people like this. Done by me and my bestest friend in the whole wide world :P It pictures our two favorite characters, Gahltha and Avra. Avra is waiting for Gahltha as he canters toward her, with the mountains of the highlands in the background, behind the forest. This is my imagining of a possible final battle between Elspeth and Ariel, for some reason I can see it coming down to a physical confrontation deep within an old missile silo. This is my take on that scene from the Nightgate trilogy, where Rage touches a wall in the dull, grey city of Fork, and rose petals escape from the wall like blood. 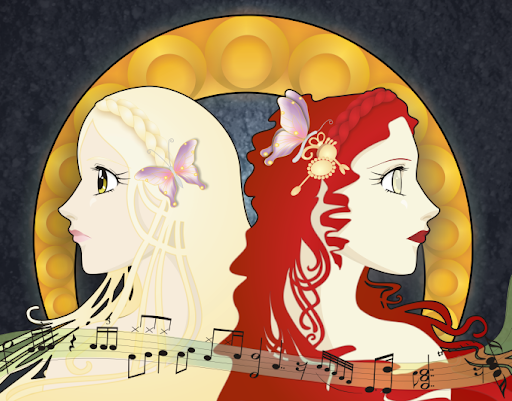 This is a fanart piece from Isobelle Carmody's series - Legendsong. This piece has been a good two years in the making :P so forgive me while I divulge into a bit of the thought processes behind this piece. I wanted to do a piece with the two sisters from Legendsong and decided I would like to do it in a slightly Art Nouveau style (i.e. inspired from Alphonse Mucha ^.^). I sketched the girls and then shaped them in Corel to what they are today :P The girls have taken on an anime look (because I love Japanese art ^.^) and their face/eyes are based on the art from Saiunkoku Monogatari. In building the composition - I actually wanted it to feature the girls looking into the void, but went through several ideas, including choosing flowers for the girls (similar again to Mucha's style), the map of Keltor etc. In the end I ended up pretty much sticking with my original idea; I used a simple Nouveau frame and then textured the background (from a photo I took from my Japan travels ^.^;). I also decided to add music to the bottom - Ember has all notes while Glynn's portion of the picture is more notes featured in percussion music (since Glynn is tone deaf and preferred resonating bass and beats). This is my take on the blackdeathroad that Elspeth will have to walk (and that Hannah walked in the Dark Road), and the massive city at the end of it. Compiled from about 5 different photos from my London 2007 holiday! WOW! that is really good. I couldn't draw like that if I spent years. I like the hair and the face. @Vauny, Re: I won't let you get it! Gosh.. that is so awesome Vauny!! I ish jealous! It just speaks Maruman's dreamtrail travels!! Wows! This is really good Smuffy. That is really amazing! How did you do the hair! ?